There is no such thing as the stereotypical entrepreneur. Even though there are some traits that most entrepreneurs may have in common (e.g. persistence, dedication), we can find a wide variety of different personality types among them. To provide a simple overview we will try to classify these types into several groups. This will also allow you to find out what kind of entrepreneur you are. Now, to make this distinction we will need two dimensions. The first one is whether or not entrepreneurs are trying to predict the future. This is important because it significantly affects their perception and activities. The second criteria is their mode of control, i.e. if they are reactive or proactive people. This aspect considerably limits or enables the opportunities that can be seized and created. When we combine these two dimensions we end up with a matrix that illustrates the four most fundamental types of entrepreneurs (see illustration 1). We will look at each type in more detail below. Planners are convinced that preparation is key in any given situation. They try to predict the future to be prepared for whatever might come up, which puts them in a reactive mode of control. Even though their strategy is highly dependent on what happens around them, planners are rarely caught off guard, because they have planned out a wide variety of different scenarios in advance. As a result they are usually experts in their fields, have an impressive technical knowledge about their venture, and an answer for seemingly every question anyone might ever want to ask. However, being prepared for everything in advance is a virtually impossible task. Because of their low allowance for uncertainty, planners are more likely to suffer from a burnout than other entrepreneurs. Furthermore they are often at risk of over engineering their products and missing out on valuable opportunities, because they spend too much time providing for all contingencies, rather than taking a risk and just jumping right in. Visionaries are the kind of entrepreneurs who want to create a future based on their ideas. They too make predictions about the future, but unlike planners, visionaries take a more proactive stance in doing so. In other words, visionaries do not only predict what is going to happen, but they actively try to make it happen. Due to their proactive nature, visionaries can have a huge impact on any industry, especially because they can get others to join them rather easily due to their energetic nature. Their confidence and beliefs often carry over to others and increase their motivation. On the flip side, this confidence can quickly turn into overconfidence. Visionaries sometimes tend to underestimate risks associated with their ventures because they are convinced they can shape the future however they want it. This illusion of control may also lead to blind spots where potential problems are overlooked completely. Adapters are the quick learners among entrepreneurs. They are aware that they can never really predict the future so they focus on adapting more quickly than others. Thus they are characterized by a reactive mode of control, which means their actions are generally triggered by specific developments or events. This reactive approach requires adapters to be extremely flexible. They are able to learn quickly and adjust within a short amount of time. To do this, most adapters have a broad basic skill set that allows them to adjust to new situations more easily than others. Despite that, they are at risk to be caught off guard by new developments and sometimes forced to act before they have fully adapted. As a result they may have a hard time establishing or maintaining a first-mover advantage, because they rely on triggers while others are more proactive. Effectuators are people who want to shape the future together with their stakeholders. Unlike visionaries they do not predict the future, but they try to create it by interacting with others. Hence they take a proactive stance. The important thing to note here is that effectuators gradually shape the future despite the fact that they don’t know what they will end up with right from the start. As the Entrepreneurial Method suggests, some of the most successful entrepreneurs are considered effectuators. They are generally very interactive people who care a lot about their stakeholders. In addition to that they are flexible and have a fairly high allowance for uncertainty. However, because of their flexible nature, effectuators may be at risk of overconfidence. A “Screw it, let’s do it” mentality will not always lead to success, so it is important to consider the consequences of a possible failure as well. There is no such thing as the stereotypical entrepreneur. However, the most fundamental types of entrepreneurs can be classified into four groups (i.e. 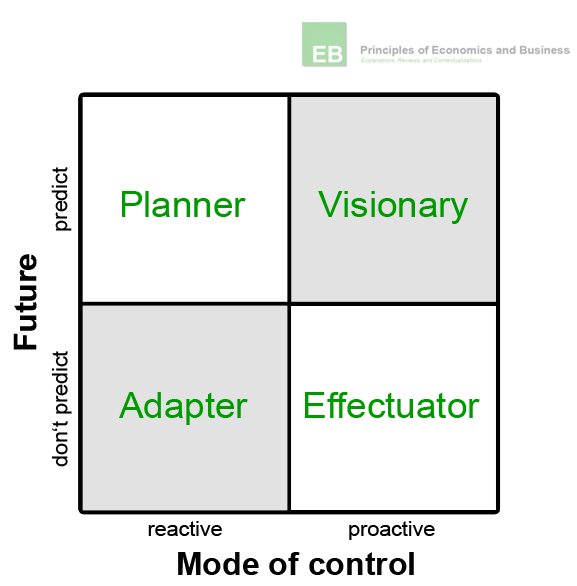 planners, visionaries, adapters, and effectuators), depending on whether or not they are trying to predict the future and whether their mode of control is reactive or proactive. The planner tries to predict the future and has a reactive mode of control. The visionary also tries to predict the future, but with a proactive mode of control. Meanwhile the adapter does not try to predict the future and shows a reactive mode of control. Last but not least, we have the effectuator who does not try to predict the future either but takes a more proactive stance.